I fell pretty quickly for the brand new The Model Bakery Cookbook of which I received a review copy. Right away, the book felt like one I’d want to settle in with to do lots of baking. The sight of the big, beautiful English Muffins that greet you at the start of the Breads chapter was the first sign that I was really going to like this book. Like most of the bread recipes in the book, this one includes a pre-ferment which results in great flavor. I can’t wait to try them. A few pages later, I jumped right in and baked the Toasted Walnut and Sage Pain au Levain which makes two sourdough boules and might just be the most perfect bread ever for a turkey sandwich. And, then I discovered the Yeasted Sweets chapter. There are croissants, Danishes, Bear Claws, and the Morning Buns made with croissant dough, rolled into swirls, and covered in cinnamon-sugar that look irresistible. The recipes are classics from experienced bakers who know what works, what’s delicious, and what people love. I’m looking at the Plum Galette recipe right now and hoping I can find some perfectly ripe, dark purple plums to use for it later this week, and then I want to bake the Carmelita Bars just to try this version with walnuts. In the Cakes chapter, there’s a Sunny Lemon Cake layered with lemon curd and topped with a lemon buttercream, a Coconut Cake with coconut in the batter as well as sprinkled on the frosting, and a Carrot Cake kept simple with just shredded carrots and walnuts and nothing extra. 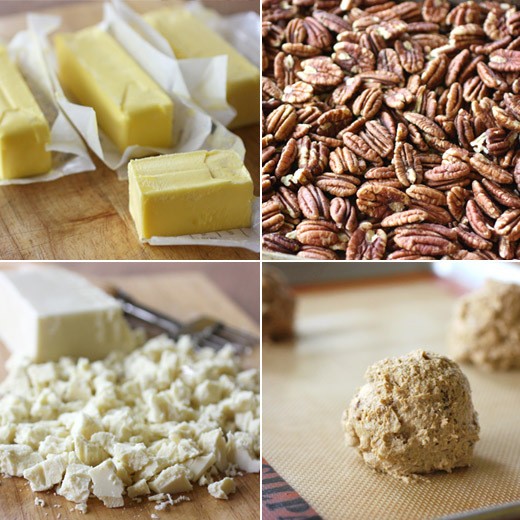 These are all familiar treats but made in particular ways that have proven to work well. 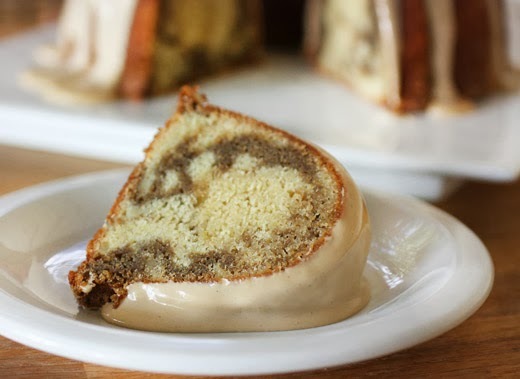 As I looked over the recipe for the Espresso Bundt Cake, call me psychic, but I sensed it would be tasty given the cup of butter and two cups of sour cream in the batter. I was absolutely correct. The photo in the book shows a nicely layered cake in which the espresso batter is baked into the middle of the cake with plain batter above and below. Mine ended up more marbled, but regardless, this is one delightful Bundt cake. The batter is made with butter, sugar, eggs, and vanilla into which sifted cake flour with baking powder, baking soda, and salt is mixed alternately with sour cream. Next, you separate a third of the batter into a second bowl and whisk some cold espresso into it. You first place half of the plain batter in a prepared Bundt pan, then the espresso batter, then the remaining plain batter. The cake bakes for almost an hour and is left to cool. I always fear cakes sticking to the ridges of a Bundt pan and butter them excessively. Thankfully, the cake slipped right out. The glaze was made with confectioners’ sugar and more cold espresso and was poured over all those pretty, Bundt ridges. To say this cake was a winner is a huge understatement. I always go for espresso flavor in sweets, and it was insanely good in this tender-crumbed cake and glaze. Kurt agreed and at one point asked me to cut a piece for myself so he could have the rest of the cake. I have a feeling there will be similar experiences with everything else I bake from this book. Recipe reprinted with publisher’s permission from The Model Bakery Cookbook . We have customers who can’t get enough coffee. Even though Karen is a tea lover, and is rarely without a glass of iced tea within reach, we pay a lot of attention to the quality of our coffee beans and their preparation. 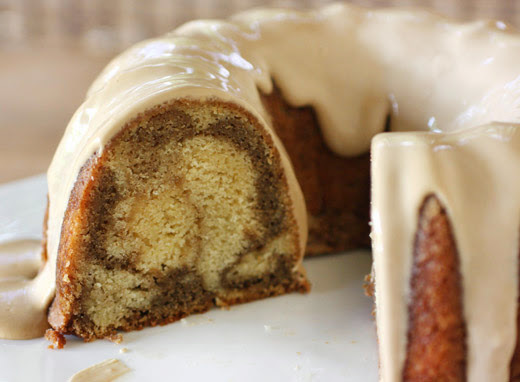 This caffeinated Bundt cake is great any time of day, but it is especially good with a morning cup of freshly brewed coffee. 1. TO MAKE THE CAKE: Position a rack in the center of the oven and preheat to 350°F/180°C/gas 4. Butter the inside of a 12-cup/2.8-L fluted tube pan. Dust with all-purpose flour and tap out the excess. 2. Sift the cake flour, baking powder, baking soda, and salt together into a bowl. Beat the butter and granulated sugar together in a large bowl with an electric mixer on medium-high speed until light in color and texture, about 3 minutes (or beat by hand with a wooden spoon for about 10 minutes). Beat in the eggs, one at a time, and then the vanilla. Reduce the mixer speed to low. Add the flour mixture in thirds, alternating them with two equal additions of the sour cream, and scraping down the sides of the bowl as needed, mixing until smooth. 3. Transfer one-third of the batter to a medium bowl. Whisk in the cold espresso. Spoon half of the plain batter into the prepared pan. Top with the espresso batter, and then the remaining plain batter. Smooth the batter with a spatula. 4. Bake until a long bamboo skewer inserted in the center of the cake comes out clean, 50 minutes to 1 hour. Let cool in the pan on a wire cooling rack for 15 minutes. 5. Run a dinner knife around the inside of the pan to loosen the cake. Invert and unmold onto a wire cooling rack and let cool completely. 6. TO MAKE THE GLAZE: Put the confectioners’ sugar in a small bowl. 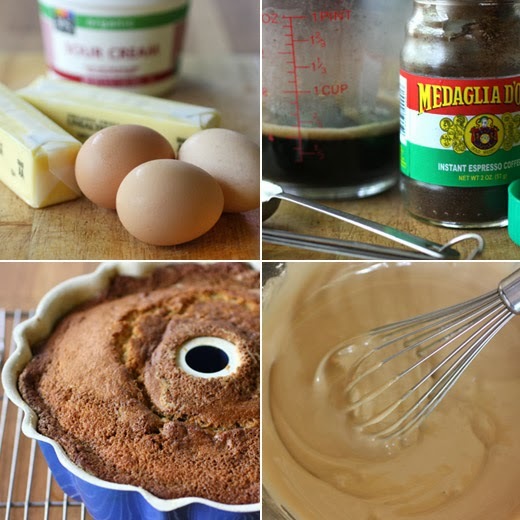 Whisk in enough of the espresso to make a glaze about the thickness of heavy cream. 7. Put the cake, while still on the cooling rack, over a large plate. Drizzle the glaze over the cake, letting the excess glaze drip down the sides. Let stand until the glaze sets. The cake can be stored, wrapped in plastic wrap, at room temperature for up to 3 days. In a rare instance of Kurt noticing what’s been happening in the kitchen, he pointed out that I’ve been making a lot of salads lately. It’s true. There was the Crunchy Corn Tortilla Salad the other day, a sesame soba noodle salad with cucumbers that I haven’t posted yet, and we have a big lettuce salad with hard-boiled eggs for dinner about once a week. At least there’s been variety among all those salads. And, the one I have for you today might not even really be a salad. It could function as a whole grain, vegetarian main course or a side dish, and you can serve it at whatever temperature you prefer. So, I don’t think this counts in the nothing-but-salads-lately tally. Besides, we’re at that juncture at which we still have plenty of summer vegetables showing up at the markets, and the fall ones are just starting to appear. Why not use them in all kinds of salads and dishes that may or may not be salads? 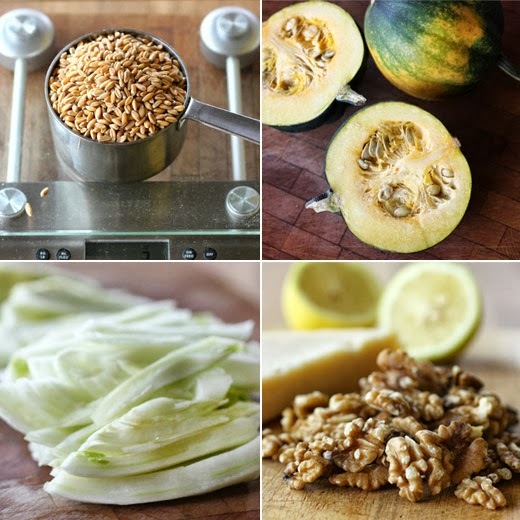 This Spelt Salad with Squash and Fennel is from River Cottage Veg , and it is a lovely way to move from one season to the next. I used two cute, little acorn squash from our CSA. Other than the spelt which is cooked on top of the stove, everything else is roasted in one pan. The ingredients are added to the pan in turn in order of needed cooking time starting with the squash. The cooked, chewy spelt was mixed with the roasted vegetables, toasted walnuts, lemon juice, and parmesan to finish the dish. The cooking time for the spelt will vary quite a bit depending on whether or not you’re using pearled spelt. I did not use pearled spelt, and so it needed to cook for a little over an hour. Pearled spelt will cook in about 20 minutes. While it was cooking, the vegetables were roasted in a 375 degree F oven. The acorn squash, tossed with olive oil and seasoned with salt and pepper, went into the oven first and roasted for about 15 minutes. Then, two fennel bulbs sliced into thin pieces and some chopped garlic was added to the roasting pan which went back into the oven for another 15 minutes. Last, walnuts were added to the pan for ten more minutes of roasting. The cooked spelt was drained and transferred to a large mixing bowl. The roasted vegetables and walnuts were added to the spelt with the olive oil remaining in the roasting pan. The juice of a lemon was added with chopped parsley and shredded parmesan. This was delicious with the vegetables still a little warm from the oven, but it was just as good served chilled from the refrigerator the next day. The spelt makes it hearty and filling, but the lemon and parsley keep the flavors bright. This recipe was just one of several that piqued my interest from the latest River Cottage book, and lucky for Kurt, they’re not all salads. Of course side dishes are more memorable to me than a starring protein. I’m not that interested in meat, so sides are where the excitement is in my opinion. At holiday meals, my plate is piled with vegetables, breads, casseroles, and salads. And, potlucks are the best events ever because they’re all about celebrating side dishes. The latest book from Tara Mataraza Desmond, Choosing Sides , does that as well. It’s an entire book of what to serve to round out meals, what to take to parties at different times of year, and what to make for those big holiday celebrations. I recently received a review copy. Each recipe comes with suggestions for what it could be served with. Brunch and lunch are covered with things like Cinnamon Challah Muffins which are like bread pudding in muffin form and Bloody Mary Shrimp Salad which could be served on toasted brioche squares or in lettuce cups. Other chapters include Breads, Salads, Weeknight Dinners, Cookouts, Intimate Gatherings, Potlucks, and Holiday Feasts. The buttery, rich Pumpkin Rolls look delightful, the Coconut Cilantro Toasted Israeli Couscous could go with all kinds of great things, and Blood Orange Wild Rice with dried cranberries will be perfect for Thanksgiving dinner. 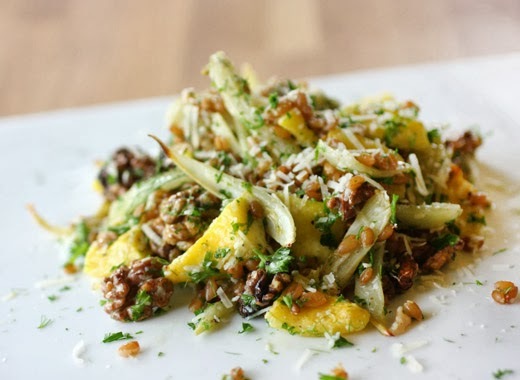 I love that throughout the book the dishes incorporate a good variety of vegetables, mix together different textures with grains and nuts, and keep flavors bright and interesting with herbs and fresh dressings. As I read the Salads chapter, the Smoky Tomato Dressing caught my eye, and then I backtracked to the Crunchy Corn Tortilla Salad to serve with it. The dressing is thickened with yogurt and combines tomato, olive oil, and red wine vinegar with smoked paprika. It sounded like a nice match for a late summer salad with lots of cherry tomatoes, avocados, sweet pineapple, and black beans. I took a few minor liberties with the salad. In the original, both black beans and pinto beans are suggested, and mango in addition to pineapple is in the ingredient list. I had recently cooked a lot of black beans and stored them in the freezer, but I didn’t have any pinto beans on hand. And when I shopped for the pineapple, it just so happened that the mangoes were all very green that day. Also, I opted for a bed of chopped, red leaf lettuce as a base rather than a mixture of iceberg and romaine. So, my salad was slightly simplified, but all the important flavors and texture were covered. For the crunchy topping, corn tortillas were cut into strips, tossed with vegetable oil, seasoned, and baked until golden and crispy. I built the salad in layers with the chopped lettuce on the bottom. Tomatoes, pineapple, avocados, black beans, cilantro, green onions, and garlic were tossed with some Smoky Tomato Dressing and spooned on top of the lettuce. 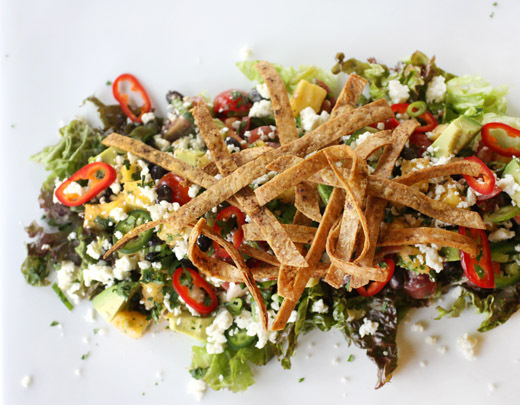 I added a few slices of hot chiles, crumbled cotija cheese over everything, and topped with salad with the crunchy tortilla strips. Even though the book is about side dishes, there are several recipes, like this one, from which I could make a meal. 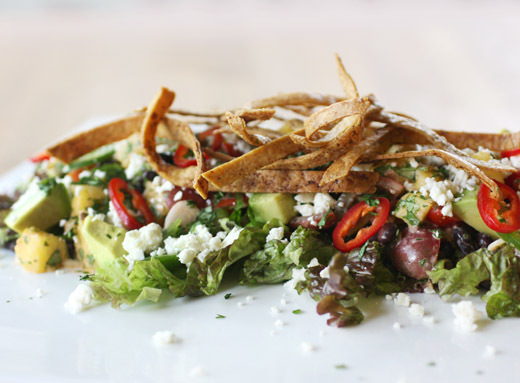 I love this type of salad with so many flavors and textures all in one place. The slight smokiness of the dressing was well-suited here. Whether you need ideas for the side of the plate or want to combine a couple of things for a meal, this book has plenty of inspiration. Recipes reprinted with publisher’s permission from Choosing Sides by Tara Mataraza Desmond/Andrews McMeel Publishing, LLC. This salad is so full of color, flavor, and texture it can easily steal the show from the main dish. Use whatever tomato variety you prefer, but this mix is a perfect place for those little red, orange, and yellow cherry, grape, and pear varieties that look like gumballs and candies tucked into pint containers on farmstand tables all through the summer. In a large, wide serving bowl, combine the tomatoes, mango, pineapple, avocados, beans, cilantro, scallion, and garlic. Gently toss everything together. (This can be prepared up to a day ahead and stored, covered, in the refrigerator.) Just before serving, add the lettuces and cheese to the tomato mixture and toss to combine thoroughly. Top with the toasted tortilla strips. The juice and pulp of ripe summer tomatoes make this dressing voluptuous in savory roundness and viscosity. Blended into thick, tangy yogurt with balancing splashes of vinegar and oil, tomatoes that usually adorn lettuce in chunks or slices drape across greens in a saucy manner instead. Smoked paprikaadds the unmistakable sultry flavor that suggests the same trademark tastes shared with bacon. 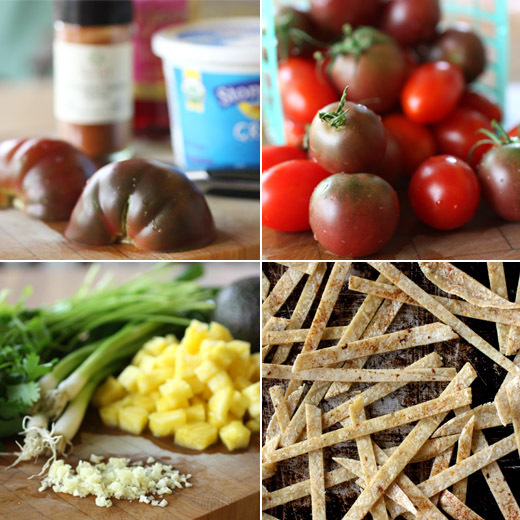 All told, this smoked creamy tomato dressing captures the famed BLT. Try it tossed with pasta, spread on sandwiches, or mixed into chicken or tuna salad. Add the yogurt, tomato, olive oil, vinegar, paprika, sugar, salt, and pepper to a blender and puree until completely smooth and creamy, 20 to 30 seconds. Adjust the seasoning to taste. Drizzle on salad immediately or cover and refrigerate for up to one week. I don’t know how I let so much time go by since I last talked about cookies around here. It might be a record of time passed between cookie posts for me. But, as soon as I made these, I couldn’t wait to mention them. 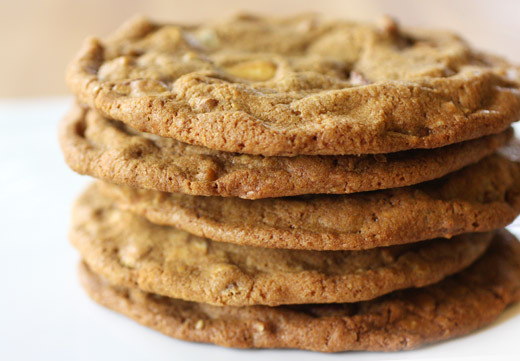 I’m drawn to new and different cookie recipes for all kinds of reasons. Sometimes it’s a mix of ingredients I’ve never tried in a cookie before, and sometimes it’s a seasonal thing. With these cookies, I absolutely had to make them for no other reason than they’re big. Actually, they’re huge. These are pancake-size cookies. I have an old favorite Big Thin Chocolate Chip Cookie made from a rich dough that spreads and spreads as it bakes. With that recipe, four cookies will fit on a baking sheet. 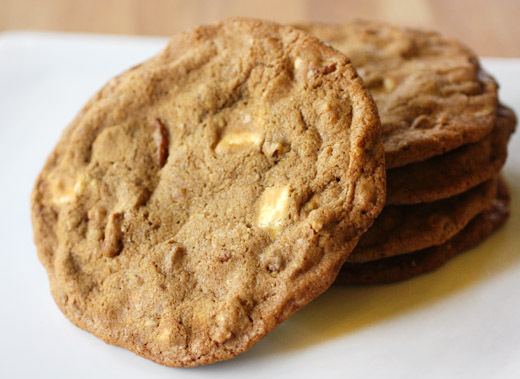 These Giant White Chocolate Pecan Cookies are made with about a half-cup of dough per cookie, and only three fit per baking sheet. They’re from the April issue of Living magazine, and the recipe is online. You might think it would be appropriate to break each cookie in half or into quarters and enjoy a smaller portion, but I encourage you to go the two-handed approach and nibble through an entire giant cookie at one time. It’s the only way to truly appreciate the thrill of a really gigantic cookie. Since I wanted to share these giant cookies with as many people as possible, I doubled the recipe. Flour, salt, and baking soda were sifted together and set aside. Butter, dark brown sugar, and granulated sugar were creamed together before whole eggs and egg yolks were added followed by vanilla. The flour mixture was mixed in, and chopped white chocolate and roughly chopped, toasted pecans were stirred into the dough. Using a big, sturdy food scoop, four ounce scoops of dough were placed on baking sheets with at least three inches between them. The dough balls were lightly pressed to flatten a bit before baking for about 16 minutes. With a cookie this big, you’re guaranteed a good mix of crispy and chewy textures. The big, sweet white chocolate chunks and pieces of pecans add more crunchy textures of their own. These easy cookies are fun to make. And, what’s even more fun is everyone’s reaction when they see just how big these cookies are. They’re as tasty as they are huge. Prior to making this, I’d only had watermelon curry once before. A couple of years ago, I had the opportunity to observe as Chef Todd Duplechan showed me how to prepare a dish of poached shrimp with watermelon curry. I remember his version was spicy and barely sweet, layered with complex flavors, and it paired perfectly with the shrimp poached in flavored oil. 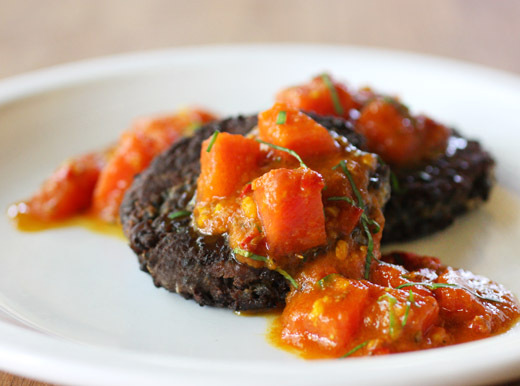 When I found this simpler dish of vegetarian black lentil cakes with the striking, bright, red watermelon curry in New Vegetarian Kitchen , I had to try it while local watermelons are available. The curry is built on a base of ginger and garlic that’s cooked along with cumin, fenugreek, and chiles. Pureed watermelon is used in addition to some small watermelon chunks for a mix of textures. It thickens as it cooks, and the savory spices balance the sweet fruit. 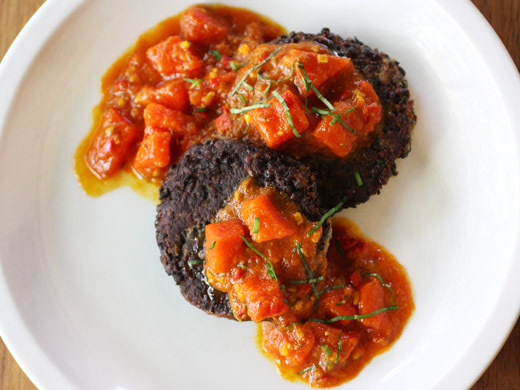 The black lentil cakes bring plenty of flavor to the dish as well. They’re a mix of cooked and mashed lentils with sauteed onion and garlic seasoned with cumin seeds, garam masala, coriander, and ground dried chiles. After shaping the cakes and tasting for seasoning, I knew they were going to be good. Likewise, while tasting the watermelon curry as it simmered, it was very good as well. But, when they came together, the crispy, browned lentil cakes topped with the watermelon curry were better than good and even better than I expected. You can approach this dish in two parts. 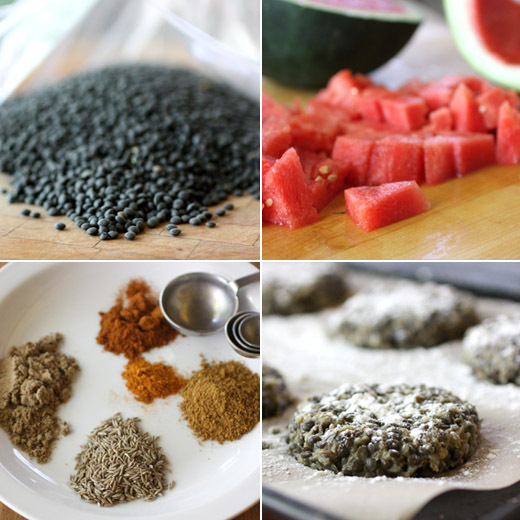 The black lentil cakes can be made in advance and stored in the refrigerator until you’re ready to brown them just before serving. The black lentils were cooked until tender which was about 40 minutes. They were then drained and transferred to a large mixing bowl in which they were mashed with a potato masher. Finely chopped onion was sauteed in a large skillet for a few minutes before garlic was added followed by cumin seeds, garam masala, ground coriander, and I added some cayenne powder. The onion and spice mixture was added to the mashed lentils along with some flour and salt and pepper. The recipe in the book suggests rather large bean cakes, but I divided the mixture into smaller portions. Each bean cake was coated with more flour, placed on a parchment-lined baking sheet, and the sheet pan was refrigerated until it was time to cook. For the curry, fresh ginger and garlic were pureed in a food processor to form a paste. The paste was cooked in a skillet with vegetable oil for about a minute before cumin seeds and fenugreek seeds were added. Finely chopped fresh red chile was added next. Starting with a five pound watermelon, half of it was pureed, and the other half was chopped into small chunks. The pureed watermelon was added to the ginger and garlic mixture, brought to a boil, and allowed to simmer and reduce for about ten minutes. It thickens surprisingly well. As the sauce reduced, the lentil cakes were cooked in oil in a skillet for about three minutes per side until browned and crisp. Just before serving, lime juice and the watermelon chunks were added to the curry, and it was spooned over the cooked lentil cakes. As I mentioned, the result here is more than the sum of its parts. The cakes are crispy on the surface and tender in the middle while the sauce is a combination of smooth puree and chunkiness. Fruity sweetness, spicy earthiness, and some subtle fenugreek bitterness work together delightfully. 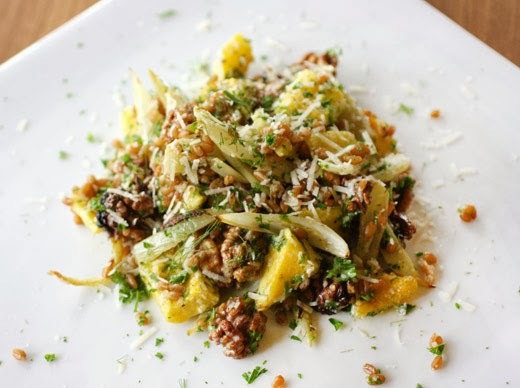 Grab a watermelon before the season ends and try it in a savory dish like this.